The Japanese Government will provide US$ 483,271 to carry out six social welfare projects in Binh Phuoc, Kien Giang, Long An, Bac Lieu, Dak Lak and Dak Nong provinces. 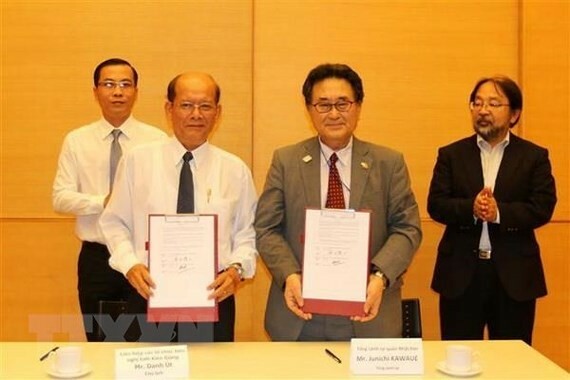 Japanese General Consul in Ho Chi Minh City Mr. Junichi Kawaue and Chairman of the Kien Giang Union of Friendship Organizations co-sign a contract to grant medical equipment for Lai Son commune’s General Clinic in Kien Hai District. The signing ceremony of the aid backage agreement was held yesterday at the Japanese Consulate General in Ho Chi Minh City. This is a non-refundable assistance of the Japanese Government. 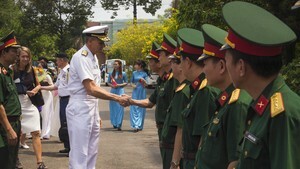 The non-refundable assistance has been applied for building a rehabilitation department at Bu Dang District’s health center in Binh Phuoc province, providing medical equipment for Lai Son commune’s general clinic in Kien Hai District of Kien Giang province, medical waste treatment systems and laboratory equipment for Huynh Viet Thanh clinic in Long An province, establishing literacy and vocational school for the blind people in Long Thanh commune of Vinh Loi District, Bac Lieu province, supplying fresh water at Ea Sup District in Dak Lak province and building five classrooms at Nguyen Viet Xuan Primary School in Buon Choah commune of Krong No District, Dak Nong province.